The Harley Street Medical Centre is a private medical centre based on the prestigious Harley Street in London. Providing their world-class diagnostic and support services to patients from all over the world, through world-renowned clinicians. 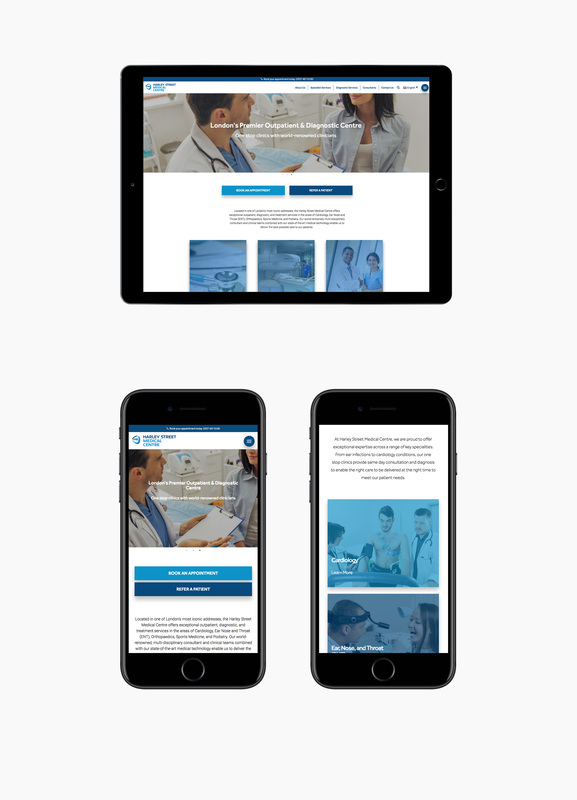 After delivering world-class healthcare to thousands of patients every year, the Harley Street Medical Centre were looking to inject a modern experience to its digital presence. 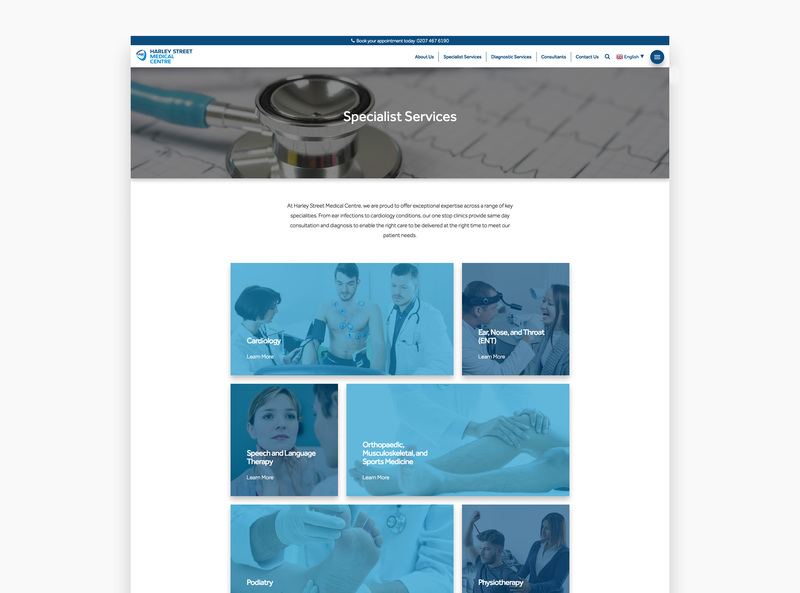 Original People were commissioned to re-engineer their website and online presence, along with developing a marketing strategy to incorporate new ways to communicate with their patients and healthcare professionals. It was important to consider the experience for both patients and healthcare professionals when re-designing the user interface and experience. During our research and discovery period, we interviewed a number of healthcare professionals within the industry to ascertain what they would consider being the most important elements when wanting to refer a patient to a clinic at Harley Street Medical Centre. We undertook the same discovery process for patients too, in order to understand how they would feel most informed about treatment and clinic information, and finding the perfect consultant for their requirements. 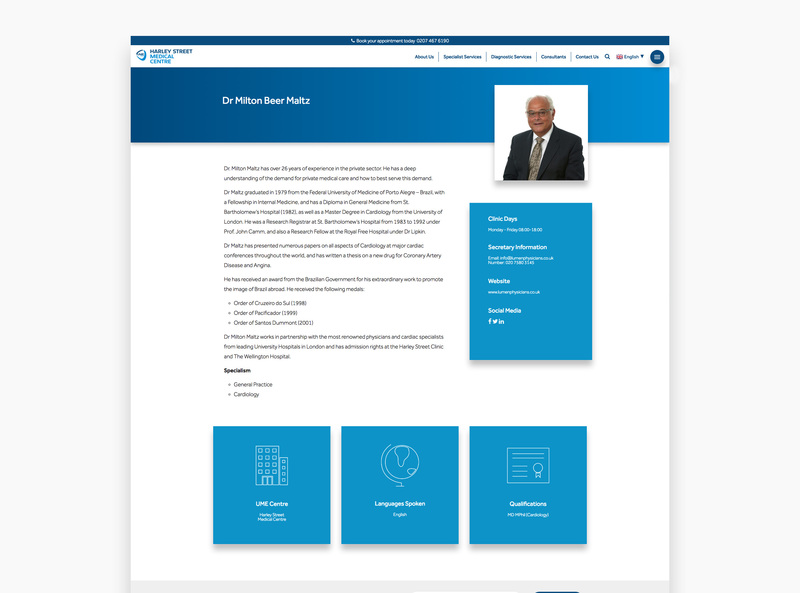 Harley Street Medical Centre asked us if we could provide a more informative but contemporary interface for consultant profiles. After having in-depth discovery meetings with consultants at the centre, we began to understand that there were a number of crucial information points that needed to be conveyed such as languages spoken, qualifications, secretary information and clinic days. We used card based designs to depict each area of the profile, in order to cluster information together to ensure that the patient will have a clearer picture when deciding to book an appointment with a specific consultant. Accessibility needed to be the forefront of the design as patients with compromised health needed to be able to use the website with ease. We hand-crafted vector illustrations throughout the website to that were in line with both the brand and newly designed interface complement the user journey and ensured that the website adapts to mobile, tablet and desktop. 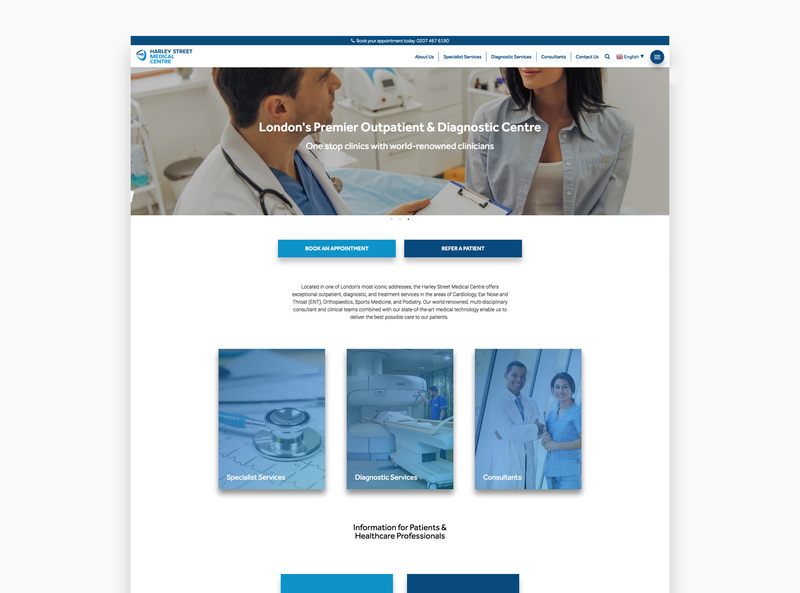 We created a number of marketing strategies and successfully implemented communication tools such so that the Harley Street Medical Centre could communicate to both patients and professionals through newsletter campaigns and instant live chat. Since going live, there has been an increase in engagement of 87% and there has been a surge in requests for consultations and treatments.